The SM400 stomp box is one hot piece of gear that gives you increasing distortion drive, intense sustain and the roaring sound of an overdriven stacked tube amp when slamming down the pedal. 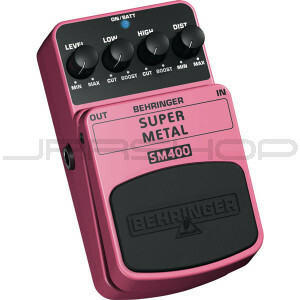 The SM400 features dedicated Distortion, 2-band EQ and Level controls for awesome sound shaping. A cool blue status LED for effect on/off and battery check plus a first-class electronic on/off switch for highest signal integrity in bypass mode are included. The SM400 runs on a 9 V battery or a DC power supply (not included).